After a completely sold out run in 2009, The Lilliput Children's Theatre Company will be returning to the Baxter Theatre with their most successful show to date. 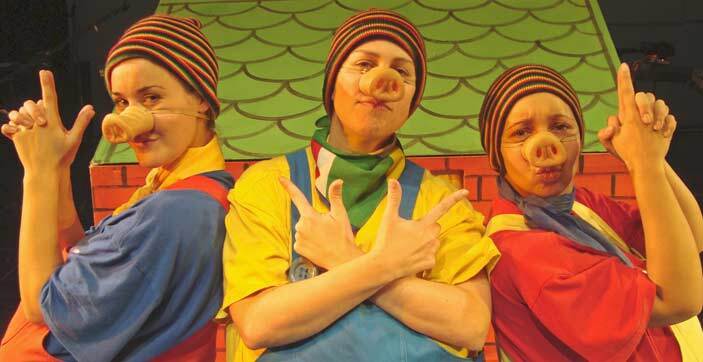 THE THREE LITTLE PIGS is back by popular demand and will run from 25th June until 13th July at 10:30am (Monday to Saturday), in the Main Theatre and the Concert Hall at the Baxter Theatre. THE THREE LITTLE PIGS - This delightful children’s classic takes place in the Karoo were the three little pigs leave their farm in the Karoo to build houses of their own. One wants to be a ballroom dancer, another wants to be an opera singer and the third wants to be a successful businessman. The big bad wolf pretends to be a travelling salesman in order to get into their homes but has to resort to blowing the houses down. When none of his disguises work, he tries to blow the houses up and ends up blowing himself up. This enchanting fairytale was adapted and directed by Elton John Duffy ( Edgemead), who has been working at the Baxter since 1993. This modernized fairytale stars; Nikki Louw (Claremont) as Peter Pig, Chi Mhende (Observatory) as Aunty Joan, Nicol De Andrade (Parow) as Percy Pig, Roxanne Gabriels (Kenilworth) as Patrick Pig and Elton John Duffy as the Big Bad Wolf. Music and Lyrics are by Elton John Duffy and Pippa Duffy and Choreography is by Nikki Louw. The duration of the show is 45 minutes and is suitable fairytale fun for the whole family. Tickets are R38,00 per person and Bookings for THE THREE LITTLE PIGS, can be made at COMPUTICKET or any SHOPRITE/CHECKERS, or online at www.computicket.com. For block bookings or queries, please call Elton on 083 364 8284 or (021) 558-2650. Or call the Baxter Theatre on (021) 685 7880. Please note that all seating is now reserved seating for this show. For more information on the Lilliput Players, visit our website at www.lilliputplayers.co.za.